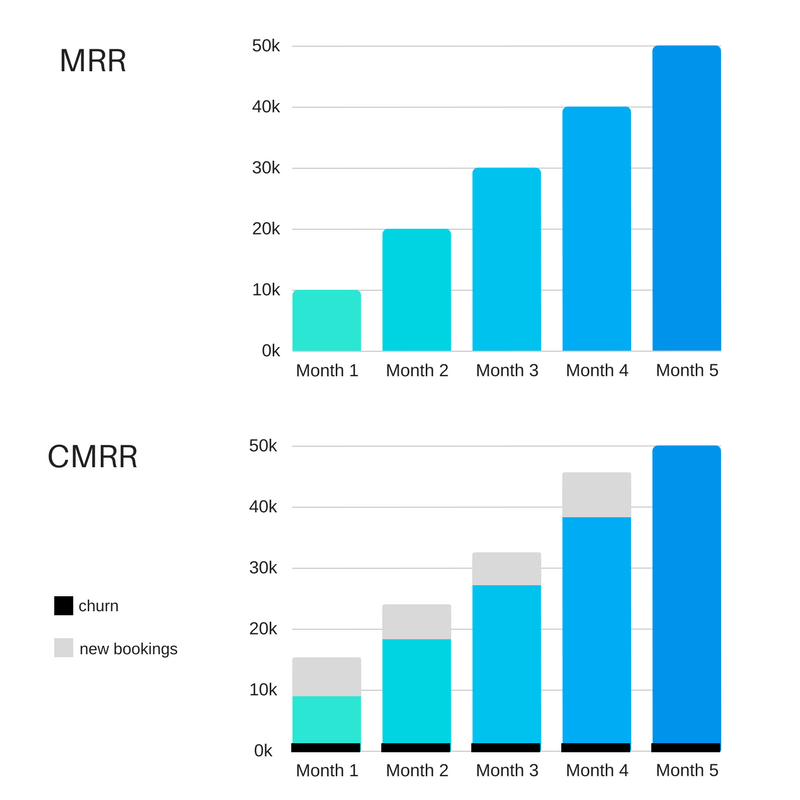 Committed Monthly Recurring Revenue (CMRR) is a prediction metric that combines recognized, monthly recurring revenue (MRR) with new bookings, churn, and downgrades/upgrades. Fees, like one-time installations, are generally excluded from CMRR calculations. This metric provides a more accurate prediction of income than MRR. It’s what banks will want to see when issuing credit, and it’s what investors and board members will want to see to monitor progress. Monthly recurring revenue (MRR) is all of your recurring revenue normalized into a monthly amount. If your average customer pays $10 per month, and you’ve got 100 customers, then your MRR is $1,000. New bookings means new, committed business – both parties have signed the contract. Churn MRR is the rate at which you lose subscribers. If you lose 1 subscriber per month, on $10 subscriptions, then your Churn MRR is $10. Downgrades and upgrades are known, positive or negative changes to your subscribers’ accounts. If customer A downgraded their account for next month, then that’s considered in CMRR. If customer B’s account will automatically upgrade come the new year, then that’s also considered in CMRR. The CMRR metric uses recognized monthly recurring revenue. What’s the difference between recognized MRR and non-recognized MRR? Recognized implies revenue recognition. Revenue recognition is an accounting principle meaning to recognize any payment you receive as revenue; you must first deliver the product(s) or service(s) entirely. So, if your subscribers pay up-front on May 1st, your accountant won’t recognize that revenue until June 1st. CMRR takes the big picture into account. You can’t forecast using MRR. Why? Because MRR doesn’t account for churn, upgrades, or downgrades. CMRR does, therefore giving you a solid and reliable income prediction. As you can see, new bookings and churn affect our curve a great deal. In this example, we’re still a positive line, but many who try and predict income with monthly recurring revenue (MRR) are in for a rude awakening since they’ve forgotten to factor in churn and downgrades. When you want a reliable prediction of future revenue, stick with committed monthly recurring revenue (CMRR).